OCEMO focusses its work, action, programmes and projects on challenges for the future - young people, employment and entrepreneurship on the one h and, and economic development on the other. OCEMO’s founding structure makes it a unique institution. Most of its members are networks, and its strength lies in the diversity of its members and their skills. Its mission is to bring them together, promote their work and encourage collaboration by highlighting the complementary nature of their activities. OCEMO is not limited to a particular focus on a geographical area or sector, and exp ands the scope of its programmes, when required. The aim of OCEMO’s programmes in this area is twofold, with both a theoretical and practical component. On the one h and, OCEMO serves civil society by organising and sharing an improved underst anding of Mediterranean populations and regions. It then supports local policymakers and provides recommendations that could strengthen their public policies. On the other h and, OCEMO helps create routes to employment and entrepreneurship, by carrying out, supporting and coordinating several programmes that promote the integration of unqualified young people who are facing exclusion, but also qualified young people who are unemployed. Making the Marseille-Provence and Euro-Mediterranean regions an attractive destination requires multiple partnerships. Important examples include Marseille-Provence region partners, who work with OCEMO on actions to make the region more attractive, and to optimise its influence. Using large events or more specific working groups, OCEMO coordinates and manages tools to promote the region’s advantages, ensuring that they are given the attention they deserve. More generally, partnerships with Mediterranean institutions, training organisations and businesses help extend programmes and export French know-how. When OCEMO was launched, it seemed appropriate to conduct an extensive survey into the expectations of young people in Mediterranean countries. • Let young people from the Mediterranean and Middle East express themselves and their aspirations. • Facilitate the decisions made by public and private policymakers. • Help implement suitable policies. The added value of this Mediterranean survey is to obtain objective information about the experience of young people, both in terms of their family situations and feelings. An initial survey was carried out in the Marrakesh-Tensift-Al Haouz region in Morocco and OCEMO has started to draw out and share the initial lessons learnt. OCEMO is now looking to repeat this survey in other regions or countries around the Mediterranean Basin. 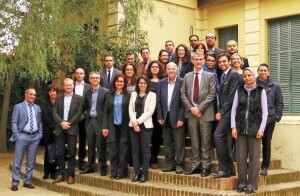 The MedNC programme is coordinated by OCEMO, in partnership with the Second Chance School (E2C) in Marseille and the French Development Agency (AFD), and certified by the Union for the Mediterranean. It consists of developing a network of employment access initiatives, with “Second Chance” certification, with a view to helping young people across the Mediterranean access employment. • Help improve the employability of young people, particularly young women, in order to reduce the youth unemployment rate in Mediterranean countries. • Support the development of local businesses by providing them with a workforce specially trained to meet their needs. • Improve awareness among public authorities of the major challenge of accessing employment, even for young people, in order to strengthen existing relief and support measures in target countries. • Strengthen cooperation across the Euro-Mediterranean region between stakeholders who work to promote the social and professional integration of young people via experience feedback and knowledge transfer. 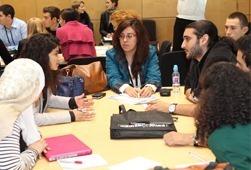 The creation of student associations under the JEY project - “Jeunes Entrepreneurs - Entrepreneurship for Youth”. This project offers a system that brings together students, their teachers and partner businesses/organisations, in order to offer unemployed young people support in starting businesses. It is led by the Réseau des Ecoles d’Ingénieurs et de Management (RMEI-RMEM) and jointly coordinated by OCEMO. The EDILE project aims to improve governance mechanisms and build the capacity of local authorities and economic organisations, in order to maximise the positive impacts of investment projects and promote sustainable and inclusive economic development in Mediterranean countries. The Mediterranean Economic Week is a partnership initiative which aims to encourage networking between businesses, institutions and civil society representatives for a week in Marseille, in order to discuss and debate the major economic issues facing Mediterranean and Middle Eastern countries. 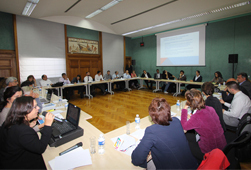 It is organised by the Provence-Alpes-Côte d’Azur Region, City of Marseille, the Urban Community of Marseille-Provence Métropole, the Euroméditerranée Urban Development Agency, the Marseille-Provence Chamber of Commerce and Industry and the French Ministry of Foreign Affairs and International Development. OCEMO has coordinated this event since 2012. OCEMO seeks to distribute the work of all its members and share their experience. In order to boost projects as best as possible, OCEMO serves its partners by organising workshops in line with their current situation. This may involve a seminar, round-table meeting, workshop or other event.